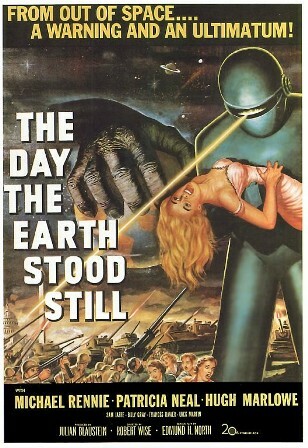 In 1951 there was a movie called The Day Earth Stood Still. In this film, Klaatu –the alien visitor here to investigate Earth –is shot while trying to give a gift to the President. Eventually, the military hunts down the alien and kills him, after which he is resurrected by his powerful robot, Gort. “I am leaving now. You’ll forgive me if I speak bluntly. The universe grows smaller every day and the threat of aggression by one group anywhere can no longer be tolerated. There must be security for all or no one is secure. This does not mean giving up freedom, except the freedom to act irresponsibly. Your ancestors knew this when they made laws to govern themselves and hired policemen to enforce them. We of the other planets have long accepted this principle. We have an organization for the mutual protection of all planets and for the complete elimination of aggression. The test of any such higher authority is of course the police force that supports it. For our policemen, we have created a race of robots. Their function is to patrol the planets in spaceships like this one and preserve peace. In matters of aggression, we have given them complete power over us. This power cannot be revoked. At the first sign of violence, they act automatically against the aggressor. The penalty for provoking their action is too terrible to risk. The result is that we live in peace without arms and armies, secure in the knowledge that we are free from aggression and war. Free to pursue more profitable enterprises. We do not pretend to have achieved perfection, but we do have a system and it works. I came here to give you these facts. It’s no concern of ours how you run your own planet, but if you threaten to extend your violence, this Earth of yours will be reduced to a burned out cinder. Your choice is simple, join us and live in peace or pursue your present course and face obliteration.